Whether you’re serving up a three course meal or a buffet full of tasty appetizers, presentation is key at any event you’re throwing. Bringing some color into your tablescape isn’t difficult! You can incorporate pops of it through decor, fabric and florals, but that can get one-dimensional pretty fast. You want your tablescape to be as festive as the party you’re throwing, so mix it up with this simple but gorgeous DIY! This affordable project first captured our attention on LydiOutLoud’s insta feed, but we’re seeing the paint pouring trend everywhere right now. Paint pouring, or “flow painting,” requires very little artistic experience or talent and only a few supplies, so it’s the perfect beginner DIY with a guaranteed flawless result. The marble look is so on trend at the moment, and so are bright pastel colors and rich, deep tones. 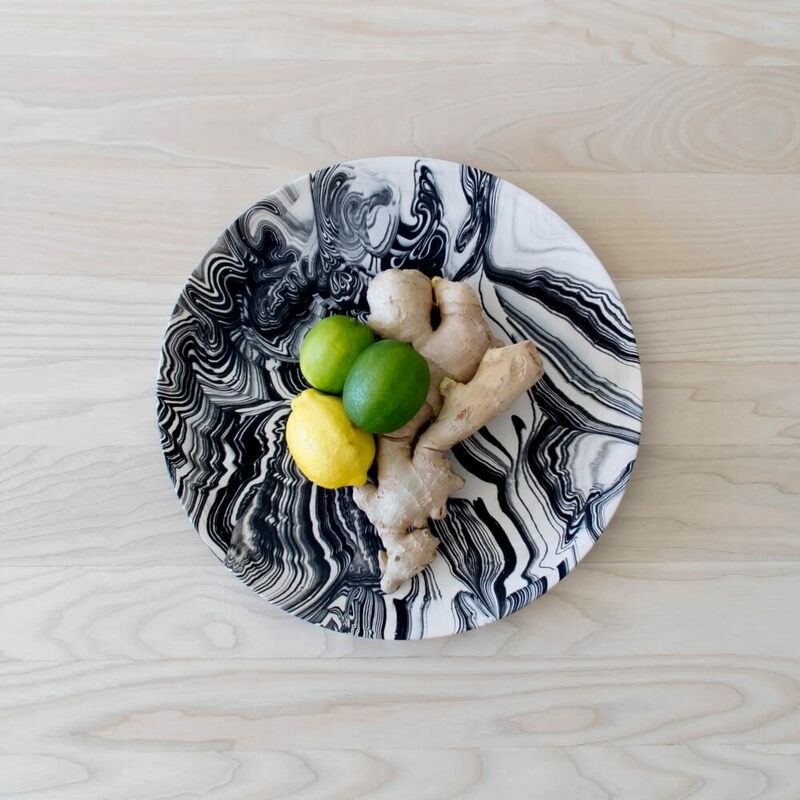 Why not incorporate the two trends together with these gorgeous, one-of-a-kind marbleized plates? The best part about this DIY is the low-end cost, but high-end results. You can go out and buy all new clear glass plates if you’re looking to make an entire set to store away at home (any Dollar Store is perfect for this), but you can also just thrift some old glass pieces, too! A vintage-turned-colorful marble charger would be the perfect staple to keep on your dining room table during the spring season. Go the classic black and white marble look for everyday decor, or you could even get super creative for a baby shower or gender reveal and paint pour some gorgeous pink and blue plates. We also love the look of adding in some metallic gold and white paint to your color scheme and complimenting the look with gold silverware - the end results are stunning! Using a ratio of 1:1, mix each individual paint color with the Pouring Medium in their own separate cup. Layer each mixture in another cup, but don’t stir them together. Elevate the plates you’ll be decorating face down on a cup or stand so that any extra paint can drip off onto the surface below. If you want that extra pop of metallic paint, LydiOutLoud has an awesome suggestion: splatter some on before you pour your colors! Pour the cup of layered paint all over each dish as evenly as possible. Pick up the plate - and yes, this will get a little bit messy, so grab some gloves! - and tilt it so that the paint becomes more marbled and swirls together. Let the paint dry for 24 hours, then peel off any extra paint that got on the edges or serving side. Pour a layer of the Clear Pouring Top Coat evenly over the painted bottom for a high-quality and vibrant look. Dry this coat overnight, too! If you want to make sure your paint stays perfect over time, add two coats of Dishwasher Safe Decou-Page. This doesn’t make your new dishes dishwasher safe, but it does make sure that chipping is minimal, so it’s a great extra step to take!